Writing Your Federal Resume: This virtual presentation will explain each section of the job opportunity announcement (JOA) in an effort to better inform applicants and to assist them in selecting the right job. The presentation will highlight a 3 part process to assist applicants in writing their Federal resume. Attendees will be shown a real JOA and walked through a process that helps them review the JOA to determine qualifications and interest, identify the important requirements and then they will be taught how to tailor their resumes with the JOA. Lastly, we will provide a quick overview of the resume builder on USAJOBS. Additional dates will be available and posted on USAJOBS in the near future. This morning, the Airman & Family Readiness Center provided live access to the U.S. Office of Personnel Management (OPM) presentation on Writing Your Federal Resume. The presentation highlighted a 3 part process to assist applicants in writing their Federal resume. Attendees were shown a real job opportunity announcement (JOA) and walked through the process that helps them review the JOA to determine qualifications and interest, identify the important requirements and then tailor their resumes with the JOA. They also provided a quick overview of the resume builder on USAJOBS. The Ellsworth AFB Airman & Family Readiness Center will be screening this FREE virtual presentation in our classroom LIVE as the U.S. Office of Personnel Management (OPM) presents it. The presentation is scheduled to begin at 8:00 AM and run until 9:30 AM. Please call 385-4663 to register! It will explain each section of the job opportunity announcement (JOA) in an effort to better inform applicants and to assist them in selecting the right job. The presentation will highlight a 3 part process to assist applicants in writing their Federal resume. Attendees will be shown a real JOA and walked through a process that helps them review the JOA to determine qualifications and interest, identify the important requirements and then they will be taught how to tailor their resumes with the JOA. Lastly, we will provide a quick overview of the resume builder on USAJOBS. This is my résumé. There are many like it, but this one is mine. My résumé is my best friend. It is my life. I must master it as I must master my life. I swear this creed. My résumé and I are the defenders of my future. We are the masters of my destiny. We are the saviors of my financial future. So be it, until employment is secured, and there is no uncertainty, but my final retirement! Join us to discuss the hiring process with a panel of experienced HR personnel from local companies. 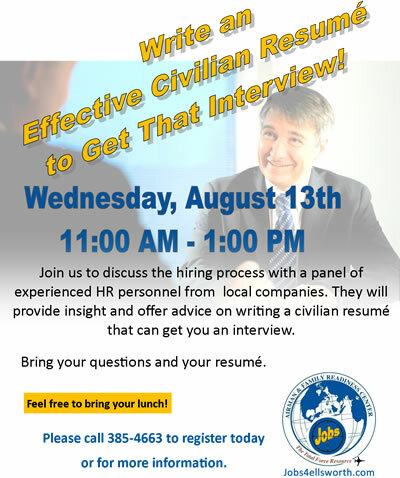 They will provide insight and offer advice on writing a civilian résumé that can get you an interview. Bring your questions and your résumé. Feel free to bring your lunch. Anyone with base access is welcome. Please call 385-4663 to register. Goodwill Industries will be hosting a Fall Job Fair on Thursday October 10, 2013 from 11:00 AM till 3:00 PM. Job fair participants include: Baymont Inn, Kelly Services, N.E.W. Corporation, Habitat for Humanity, Goodwill Industries, USAF/Army/Marine and Navy Recruiter services, and Black Hills Works. For FREE resume and interview skills assistance on October 7,8,and 9, contact Makayla Leech or Jeff Smith at 605-737-3954. Job Fair to be held just behind Dickey’s BBQ off of Haines Ave. Need some inspiration and motivation to get your federal job search kick started in the new year? We are introducing a NEW webinar series on “7 Tips to a Federal Job,” and they are absolutely FREE! Just click on a registration link below (or as many as you would like to listen to!) to sign up today.